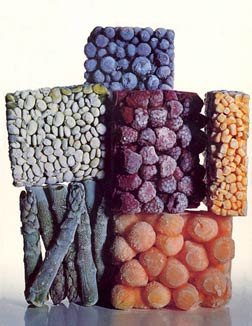 I've always really quite liked Irving Penn. I know he has his detractors - he's really just a fashion photographer fooling us he's an artists and so on. But watching what he has produced overt the years - and continues to produce into his 90's - you can't help but admire the creative mind and aesthetic sensibilities at work behind the camera. Anyway, over on the LF list I saw a reference to Penn and Epson K3 inks... so I had to check it out. And true enough, earlier this year Pace/MacGill Gallery had a show of Penn's work (these beautifully "Pennesque" flowers among others) which not only had classic dye transfer prints and Platinum prints (remember this is the guy who pretty much re-introduced platinum printing to the photography world) but - horror of horrors - Epson Inkjet Pigment Prints - on the beautiful Silver Rag paper (ahem - the paper chosen for my print offer), as well as basic old Epson Enhanced Matte. 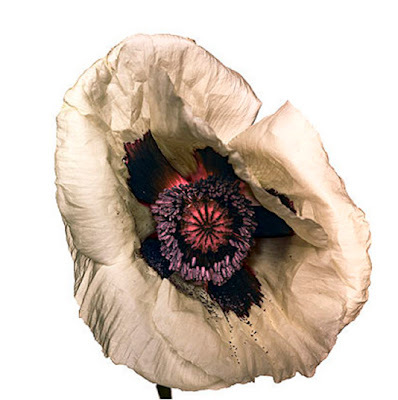 From the Gallery: Pace/MacGill is pleased to present an exhibition of flower studies made by Irving Penn between 1967 and 2006. Penn has been working in this genre for over four decades, utilizing a variety of printing processes that meet his consistently high standards for quality. The show will feature a series of color close-ups printed with digital and dye-transfer methods as well as a black and white platinum print. Without artifice or sentimentality, Penn’s flowers are statements of fact. Recording what is in front of his lens with as much fidelity as the camera allows, the photographs dissect each whorl and petal, each stem and stamen with the honesty of an X-Ray. Penn examines the topography and biological wonder of each specimen, many of which are in a state of decay. 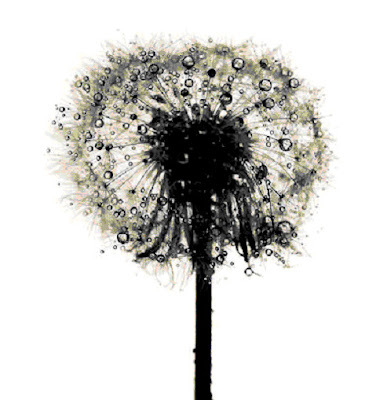 He makes note of the feathery skeleton of the Dandelion/Taraxacum officinale bearing the weight of droplets of water and the withering petals of Peony/Paenoia: Silver Dawn. Each browning, twisting flower is seen with cool objectivity. Beyond the display of striking clarity, there are moments within each composition where Penn’s objective study becomes poetic contemplation. 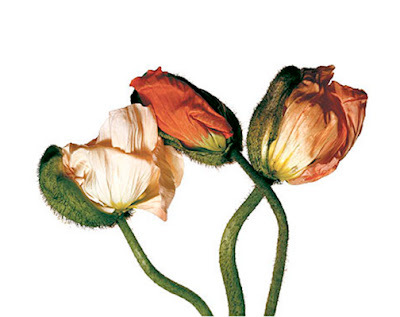 The passage of time is implicit in these images: the pink pigment drips from the tips of Tulip/Tulipa: China Pink and Iceland Poppy/Papaver nudicaule (C) is caught cocooning into itself. With subjects found at the penultimate moment before their expiration, Penn documents each flower’s vitality while speaking of its mortality. I'm pretty sure there's a few folks turning in their graves over this, as well as a few others who think it must be a sure sign of the End Times... But kudos to Pace/MacGill for being willing to actually show these (though I'd have to wonder if they actually had much choice in the matter! ).